To the right you can see some of our favourite damask fabric. Simply click on individual fabric pictures to go to the product detail. Since its earliest production Damask fabric has been associated with luxury. It is a flat weave in which the design - often a stripe or a floral motif - is created by the contrasting use of shimmering satin weaves over a plain or twill background. Originally Damask was made from silk elaborately woven in several colours, with metallic threads such as gold sometimes added in. This cloth is now usually made with cotton or polyester or a combination of these. Damasks are versatile fabrics suitable for all interior furnishing requirements. They are particularly good for combining across curtains and upholstery, having a classical appearance evoking period wealth and style. They are also ideal for cushions, curtains and blinds, throws and tablecloths. Damasks are similar to Jacquard fabrics. 'Jacquard' is a name given to any fabric made on a jaquard loome. That is an advanced automated loom which can produce a vast array of fabrics designs not easily achieved on a hand loom. In terms of appearance, in a Damask the design or pattern appears to sit 'on top of' the base layer of fabric, and the pattern can be seen in reverse colours on shading on the underside of the cloth. By contrast the pattern in a Jacquard fabric is usually flat and does not exhibit the reverse shading effect. 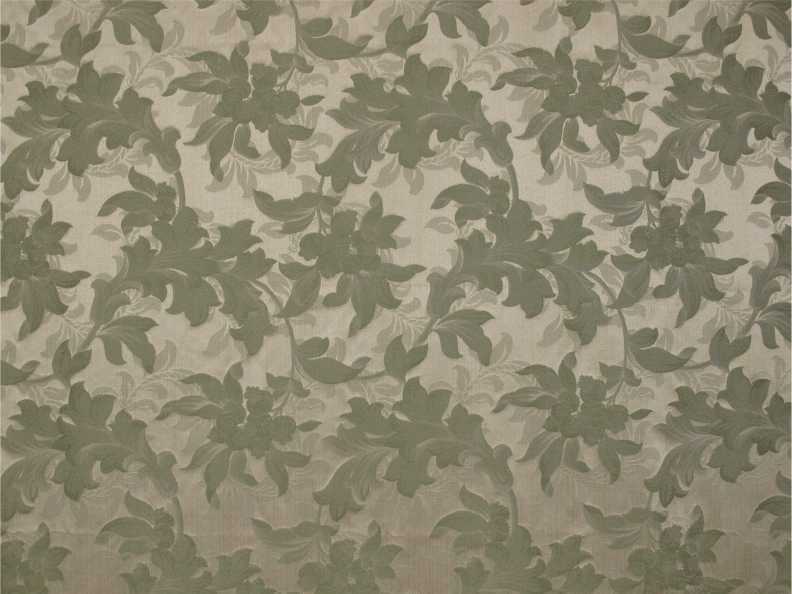 Damask upholstery fabric is glossy and patterned material suitable for use a furniture material. The finest and most expensive damask upholstery fabric was originally made from silk but this fibre is not very durable and is costly to produce. 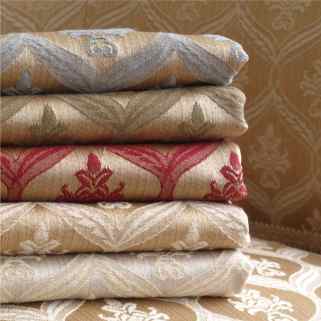 Consequently, most damask upholstery fabric is now made from cotton or synthetic fibres. Our Loome Porchester collection is a cotton polyester mix combining a fine lustrous appearance with excellent durabllity and is suitable for all general domestic upholstery. 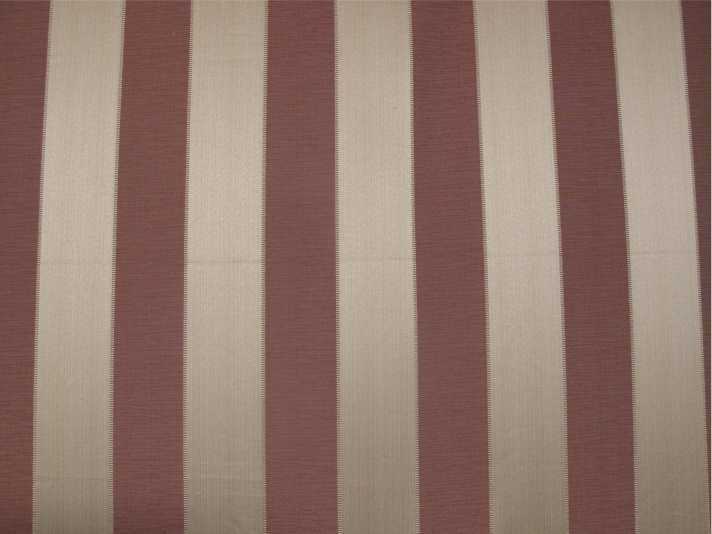 Porchester stripes are evocative of the regency period and look stunning in as upholstery on period furniture. Loome recommend damask as particularly suitable for curtains and cushions. Damask curtain fabric has a wonderfully soft drape, and will bring a look of quality and period style to any room. The pale and restrained colour palette of our Porchester collection makes it ideal as curtain and cushion fabric. Curtains made from damask curtain fabric add an unmistakable elegance and period charm to any interior.